This page includes printable cursive handwriting worksheets that focus on writing words in cursive handwriting. The lessons are intended for students who are currently learning how to write in cursive handwriting, in other words, the lessons are meant to supplement your current cursive handwriting program. If you need cursive handwriting worksheets that are designed for brginners, please view my other cursive handwriting sets. You will find them listed on the Cursive Handwriting page. The words in the two different sets are made with two different fonts. The first set is made with SchoolScriptDashed font. The second set is made with the older LearningCurve font, which I used on the worksheets at Cursive Z. Both sets are finished. Made with school script font (SS), a font that is freely available for download and includes the ruled lines. Surprisingly, the letters join quite nicely. This means that you can use the font in your word processor to make handwriting lessons. 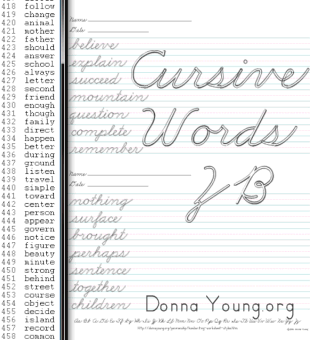 Read more about using this font at Homemade Cursive Worksheets. See also Big Cursive for ready made handwriting lessons in a large letter size. To read about another possible use for school script font, go to Homemade Handwriting Lessons in a Composition Book. The tallest letter height is 1 CM or just over 3/8ths of an inch. Each worksheet has eleven words to practice. The student should write the word repeatedly on the line and leave a small space between each word. This printable file is just like the lessons above, but without the words. There are no divisions on the paper for lessons. 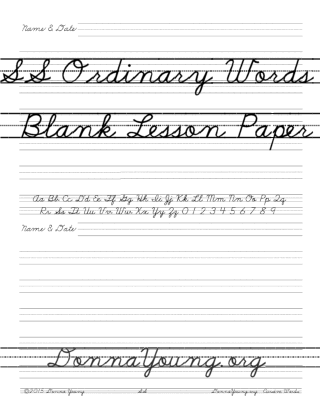 SS - Ordinary Words has two lesson per printable page and 5 ruled handwriting lines per lesson. The Ordinary Words handwriting lesson are below and requires an active subscription. The letter height on this set is a little bit shorter - 9 mm or just under 3/8th inch. Each worksheet has two lessons. The worksheet is named after the starting letter of the words. What is HB? It is a style of handwriting that is like Harcourt Brace®. The letter height on this set is a little bit shorter than the other sets - 9 mm or just under 3/8th inch. Each worksheet has two lessons. The worksheet is named after the starting letter of the words. Harcourt Brace is a registered trademark of Harcourt Brace & Company. ZB Cursive is a new set as of 2011. ZB Sets resembles Zaner-Bloser.